Is Facebook Suffocating the Rest of Social Media? Forrester Research recently released a 2010 update to its Social Technographics® data that analyzes the social behaviors of global Internet users. For the first time, the percentage of U.S. consumers engaged in certain social behaviors actually went down, not up. Is the bloom off the rose? Is this the long-promised social media backlash? Overall, social media usage among U.S. adults with Internet access declined 1% from 82% to 81%. This is certainly not a statistically meaningful atrophy, but it paints a picture of a plateauing social Web, where the remaining holdouts are simply not going to jump on board. Forrester analyst Augie Ray made a case for this plateau on his blog recently. Ten percent of the country doesn’t have cable or satellite TV, and six percent (under the age of 45) don’t have a cell phone. So, I don’t see a one percent decline in overall social media usage as alarming, but rather a signal that the social media “market” is officially mature, and the rampant growth of the past three years may be a thing of the past, like Paula Abdul’s career. To me, the more disturbing findings are in the composition of social behaviors. The number of Creators (people that write blogs and upload video); Critics (people that review products and comment on blogs); Collectors (people that use RSS and social bookmarking sites), and Spectators (people that read blogs and watch videos) ALL went down by 1% to 5%. This means that the number of Americans engaged in just about every social media activity was reduced in the past year. The percentage of online Americans who are Joiners (members of a social network) increased from 51% to 59%, a huge change in comparison to the rest of the behaviors examined. The fact that the number of social networkers (read: Facebook) is almost as large as the number of blog readers and video watchers (59% to 68%) is the most striking finding in this research. Our love for virtual farming; the ability to keep in touch (somewhat) with an ever-broader circle of “friends”, and the allure of digital bumper sticking when we “like” brands is overwhelming our desire and ability to engage in other social behaviors. Why read a blog, when we can look at the headline and first two sentences in a Facebook status update? Why watch videos on YouTube, when the best of them will inevitably be posted on Facebook? Why bother reviewing businesses at Yelp.com when you can just see which places your friends prefer based on their “likes” – or use of Facebook Places? Why use Digg or StumbleUpon or Delicious, when the people we care about already share with us the content they appreciate via status updates that include links? Our Facebook addiction is threatening the core sociability and widespread content consumption, sharing, and curation behaviors that gave it succor in the early days. Certainly, there are still PLENTY of people watching YouTube, reading blogs, and Digging their hearts out. 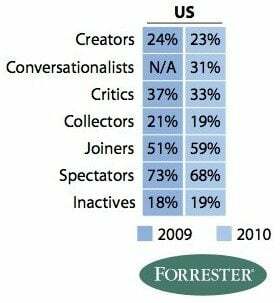 But this trend of all social participation declining – except for one specific type – disturbs and frightens me.